Halo-halo from New Filipiniana, Houston, TX. Photo by Gary Wise, used with permission. The Filipino dish halo-halo is often described as a dessert, although it is really quite filling in many incarnations. It's a member of a family of ice-based dishes found throughout Asia, from Korea's patbingsu, to the Taiwanese shaved ice bowls. The name literally translates to "mix-mix", which is both an admonition on how one is supposed to eat it, as well as a description of what the dish is. A number of sweetened items, from beans, to yam, to ice cream, are piled together with crushed ice and milk. Mix it up, and enjoy. But food evolves. 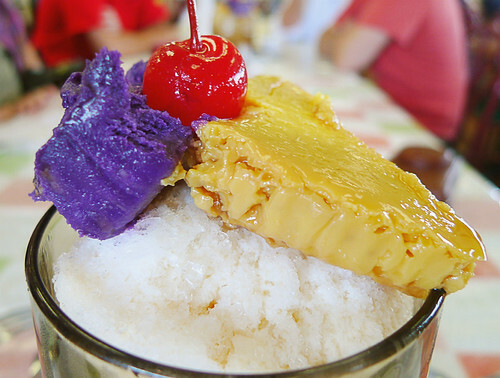 While many halo-halo preparations boast of a large variety of ingredients in a glass, one shop in Manila specializes in what could be an early ancestor to the modern halo-halo. This version only has three ingredients outside of the ice and milk: flan, sweetened bananas, and hominy. But much care is taken in the shaving of the ice, such that it yields more easily to the mixing spoon. And with relatively few ingredients, the care taken in its construction is more evident in the less muddied flavors. It is perhaps akin to the difference between a classic Neapolitan pizza margherita and the Americanized superloaded delivery pizza. Old School Halo-halo. Mandaluyong, Philippines. Only three mix-ins, but the ice is super fluffy.